Ducklington is a village and civil parish on the River Windrush 1 mile (1.6 km) south of Witney in West Oxfordshire. The 2011 Census recorded the parish's population as 1,581. Ducklington is one of the earliest Saxon parishes to be recorded in Oxfordshire. In a charter of AD 958 King Edgar the Peaceful granted at Ducklington to his Minister, Eanulf. The toponym "Ducklington" may originate from "Ducel's Farm" or "the farm of the sons of Docca", but it is locally thought to have originated from the central duck pond, where many ducks and ducklings have lived for centuries. After the Norman Conquest Ducklington was held by Robert D'Oyly, a Norman nobleman who took part in William I's conquest of England. The Dyve family then held the Lordship of Ducklington throughout the 13th and 14th centuries, living there until early in the reign of Edward III. The Church of England parish church of Saint Bartholomew is 12th century. The Gothic Revival architect E.G. Bruton restored the building in 1871. The bell tower has a ring of six bells including one cast by Henry Bagley of Chacombe in 1732. The village had a Baptist Chapel until 2016, when it was converted into a private residence. The former village schoolhouse was built in 1858. The modern Ducklington Church of England Primary School is across the village green from the original site. Today, Ducklington is notable for the rare fritillary flower (mainly of the snake's head variety), many of which grow in a specially designated meadow just outside the village. Before the Second World War, many fritillaries had grown on fields all over the Windrush Valley. However, the national drive for food production during the war meant that most meadows were intensively ploughed, the rivers dredged, and consequently the fritillaries were lost. Only the current fritillary field was left coincidentally unploughed. The flowers have survived with help from both locals and farmers. Once a year, the local community celebrates Fritillary Sunday when the field, church and hall are opened so that the public may walk amongst and enjoy the flowers. The celebration has been featured in Country Life magazine. Ducklington has a Morris dancing side and Mummers performances. It also has its own Morris Dance tradition; its own style of dance that was collected around the beginning of the 19th century. The Ducklington tradition is danced by many sides throughout Britain and the United States. Ducklington has one public house: The Bell, and a sports and social club. Recently[when?] Ducklington has hosted several flower and garden shows. The former tithe barn is now the village hall, which has been renovated in the last few years. It is used by village groups including the Parish Council and is the parish polling station in local and national elections. Ducklington has a Women's Institute. Ducklington Sports and Social Club has several cricket and football teams. They include three men's football teams that compete in the Witney and District League. Ducklington's football first XI is in the Witney and District Premier Division. The club has nine boys' teams. The cricket section has one adult teams and three youth teams. 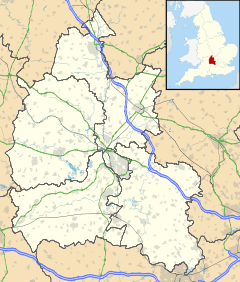 ^ "Area selected: Ducklington (parish): Key Figures for 2011 Census: Key Statistics". Neighbourhood Statistics. Office for National Statistics. Retrieved 11 September 2013. ^ a b c Sherwood & Pevsner 1974, p. 589. ^ Crossley & Currie 1996, pp. 140–148. ^ "Sold property in Witney Road". John D. Wood and Co. John D. Wood and Co. Retrieved 28 July 2017. ^ Witney & District Football Association. "Premier Division". Pitchero. Retrieved 19 April 2016. Sherwood, Jennifer; Pevsner, Nikolaus (1974). Oxfordshire. The Buildings of England. Harmondsworth: Penguin Books. pp. 588–590. ISBN 0-14-071045-0. Wikimedia Commons has media related to Ducklington. This page was last edited on 8 November 2018, at 13:09 (UTC).